Recording one couple's attempts to live a more self-sufficient lifestyle. In autumn 2010, my husband Ian and I both quit our jobs, sold our house and left the flatlands of the east for the mountains of Wales. Our goal is to create a more self-sufficient lifestyle in a place we actually like living. Whilst Ian will continue to earn some money as a freelancer, my part of the project is to reduce how much we spend by growing and making as much of what we need as possible. The purpose of this blog is to keep friends updated with how the grand project is progressing, but all are welcome here. If you're not a friend already, well perhaps you might become one. Some jobs are much harder than you expect them to be, but just occasionally, a job turns out to be easier than expected. This was an easy one. When we finally got fed up with the artistic effects our old inkjet printer was applying to every page, we bought a second hand laser printer for the princely sum of £50. We then spent almost as much on a toner cartridge (magenta) but haven't actually needed to use it yet, despite the fact that the machine's been complaining for months that it needs changing. We don't do very much printing. The new printer is much bigger than the old one and has been getting in the way and annoying us for some time. We decided that we needed a little table for it, preferably on wheels so we can pull it out to clear paper jams that inevitably occur at the back. I thought the pieces of fitted wardrobe that we took out of the spare bedroom might do, so I measured the printer and took my tape measure down to the workshop to see what I could find. The first piece I picked up - and I didn't even have to climb over anything to get to it - was just the right size. There were three others the same size with it, and they still had the brackets attached that fixed them together when they were a wardrobe. They also had hinges, which unscrewed easily. It didn't take much turning about to find a way of fixing three of these four pieces together. I then put my hand out and found a short piece that fitted perfectly to reinforce the front, then not much more searching found another piece the same to go across the back. The whole job took about twenty minutes. New printer table in situ. There's even space underneath for the old printer (still serviceable as a scanner) and the spare toner cartridge. No wheels, though. I don't think we own any casters, so finishing the job will require shopping. I'm not sure it's going to happen. Alongside getting the underfloor insulation finished, I'd applied for a grant for loft insulation, of which we had very little. I filled out an online form and got an email letting me know which local installer would be contacting me, followed shortly by an email from said installer asking when would be suitable to conduct the survey. At this point I hesitated because the survey was to check that the house was suitable, and I was worried there might be damp in the loft which would rule us out. There definitely had been damp, and there had been insulation stuffing up the ventilation gaps in the eaves, too. I'd removed the insulation some time ago but needed to check whether it had solved the problem but couldn't face going up there to check, and potentially find a problem I didn't know how to fix. Eventually I got round to it, found no damp, and sent an email suggesting a few dates for the survey, then... heard nothing. After quite a lot more of hearing nothing, I was surprised when a bloke turned up saying he was here to do the loft survey. OK, wasn't expecting him, but never mind. He checked one of the three sections of loft (the house is in three parts; so is the loft), asked whether the other two were much the same, and confirmed that we would be eligible for free insulation, and that it would be installed in a few weeks (a letter arrived a couple of days later with an installation date). Indeed it was. 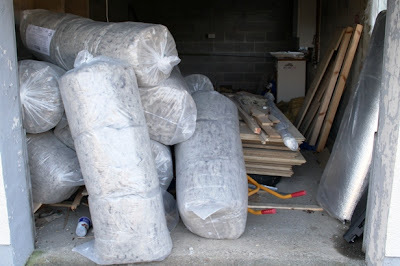 The same bloke and another one turned up with a van full of insulation and filled our loft with it. In the process they discovered a complete absence of joists in the middle section of the house. Interesting. We'd removed the most awkward things that were stored in the loft (notably a mattress) but they were OK to work round the smaller things. Nonetheless, it was obvious that stuff in the loft created a problem when resting on all that fluffy insulation. I asked what we should do about this - it's obviously not an uncommon problem, so there must surely be a common solution. Apparently what we should have done was to build up the joists so that the insulation could go between them and boards sit on top. No clever solutions available at this stage. Hmm. A google search quickly revealed this information to be complete rubbish. I had thought about what I'd ideally need to solve this problem: Short posts to go through the insulation with brackets on the bottom to fit over the joists. Then I could screw the boards down to the top of the posts like a many-legged table. It seems that I wasn't the only one to hit on this design: Loft storage stilts are exactly what I had in mind, but with an additional disc on top to make the screwing down part easier. According to the website, they're only available at B&Q, which is OK as we now have a B&Q in Aberystwyth. I checked this company's website, but no mention of the stilts. I sent an email to the manufacturers expressing hope that they were still in business, dismay at their product's absence from B&Q's website, and some pessimism about my chances of getting any sense out of B&Q's staff. My pessimism proved ill-founded (well, it may have been well founded, but it was unfulfilled) when we went into B&Q the next day for mortar, and while we were there I asked about the stilts. These couldn't actually be found in the shop, but were on the computer, albeit with unclear information about how many there were, and where. The staff couldn't have been more friendly and helpful, faced with these limitations. The next day (and the first working day after I wrote to them), I got a reply from the manufacturers telling me that they were having trouble keeping up with demand, but all branches should have fresh stock in a week's time. I waited a week, went back to B&Q, and sure enough, there was a big bin of loft storage stilts just in front of the loft insulation, priced at £1.78 each or 12 for £15. I'd calculated that I'd need 25 for four boards (and I'm glad I had, because their guide to how many you'd need didn't make much sense), so that cost £31.78, which wasn't too bad, especially as I'd only seen the each price on the computer the previous week. Right then, boarding the loft. Obviously I wasn't approaching the job quite the right way. Even with the fancy stilts, I still should have starting before the insulation was laid across the joists. Oh well. The stilts have tabs on the bottom brackets so you can screw them to the joists, but I didn't think it would matter much if I skipped that step. They'd be stable enough once they had a board screwed to the top. I was using leftover boards from the underfloor heating, which being flooring boards were far more substantial than I needed for loft boarding, but those were what I had. They're 8' x 2', and needed stilts down each edge, spaced at one per joist. All I had to do was find the joists and poke the stilts down through the insulation and over the joist, which turned out to be surprisingly easy. Most of the places I needed stilts happened to be in the gaps between two pieces of insulation, and where it wasn't, it wasn't too difficult to tear a hole to stick the stilt through. I started next to the loft hatch with the first row, then measured 2' along the joists for the second row before fixing the first board in place. It turned out that the hardest part of this job was getting the boards up into the loft. Eight foot is pretty long, bearing in mind the typical headroom in a loft. To make it more difficult, the hatch was only about 2' square, so the board had to go through diagonally. Somehow, with a lot of manoeuvring and swinging the ladder out of the way, we managed to get the boards up. Having got a board into the loft, then next bit wasn't too difficult. One or two of the stilts fell over (not being screwed down) as I moved the board into position, but it was easy enough to pick them up again. At this stage I appreciated the big plastic discs on the tops, as they compensated for less-than-precise positioning and made it almost impossible to miss them with the screws. These really came into their own when I was screwing the second board onto each stilt as I couldn't see the stilts at this stage, so having a big target was very helpful. At least, I assume I didn't miss any; I have no way of knowing. Once the first board was in place the job got easier as I could then kneel on that board to work on the next one. There was a small setback as the space for the second board was partly occupied by the central supports for the roof, but cutting a corner out of the board solved that problem. I didn't manage to fully engage any of the tongue and groove connections between the boards, but I decided that didn't matter much in a loft. Otherwise, the job went pretty smoothly and I now have an eight foot square boarded area in my loft. The next issue raised by the new insulation was the loft hatch itself. As there's a proper fitted ladder in this section of loft, it was always a bit of a fiddle moving the hatch cover in and out of place past the ladder. With extra insulation around the edges it was almost impossible. There also wasn't space to put any insulation on the hatch cover itself, which obviously isn't ideal. We'd had a hatch that hinged down in our last house, and I thought I might be able to convert this one to the same design. I knew I had some door hinges somewhere, and even managed to find them, after a bit of tidying up. Again, far more substantial than the job required, but they were what I had. I also found a rather cute little brass latch that I'd probably inherited from Grandma. ... and a nice little brass latch. Latch, needed as much to pull the cover down as to hold it up. Having suitably upgraded my loft, all that remained was to move stuff onto the boarding. That was easy for things already in that section of loft, but a bit more effort for things stored in the loft at the other end of the house. This section doesn't have a fitted loft ladder so we have to use a separate ladder, propped against the edge of the opening. If you push the ladder right into the loft, the hatch cover catches on it when you close it and you can't get the ladder out, so I always rest it right on the edge. It has rubber feet on both ends, so it's secure enough. As I went up and down the ladder with various boxes and bits, I cursed the flex in the ladder that added to the strain on my already aching legs. I had quite a lot of trips to do to fetch everything down and I'd nearly finished when, stepping out of the loft onto the ladder, suddenly the ladder wasn't supporting me any more. With a small shriek, I fell through the hatch after the ladder, landing in a painful heap on top of it. As I lay there, my first thought, after Ouch and catching the cast iron fire surround* that was threatening to fall on top of me... OK, my third thought was that there was no-one around to come and rescue me as Ian was out. Then I wondered what I was expecting him to actually do. Then I realised that nothing was broken and I was quite capable of moving, and the ladder really wasn't the most comfortable place to lie. I eased myself off the ladder and a few feet away until I could lie flat on the floor with my knees up and recover. Although I felt very battered, in truth I wasn't much injured. I have bruises on each arm thanks to a reflex of throwing them out as I fell - painful in a narrow hallway, but probably slowed my fall. My neck and shoulder muscles are aching and stiff from preventing my head smacking into the ground, and I have the most spectacular black-and-blue bruise across my arse from where it met a rung of the ladder. In turn, the ladder is somewhat bent. This wouldn't have happened if it had landed flat on the floor, but in the hall is the cupboard where the hot water tank lives, which we haven't yet put doors back on, and the vacuum cleaner also lives there. Without doors, the hose of the vacuum cleaner spills out into the hall, underneath a falling ladder, preventing it from landing flat on the floor. Like the crumple zone in a car, that bending of the ladder absorbed quite a lot of energy, which probably saved me from more serious injury, so you could say that Henry saved me! The moral of the story is, don't check your ladder just once at the start of a job, keep checking it as you go, in case it moves. * We brought this from our last house and haven't quite decided what to do with it yet, so it stands in the hall, propped against the wall (except when it's falling over) making a useful small shelf with its mantlepiece. 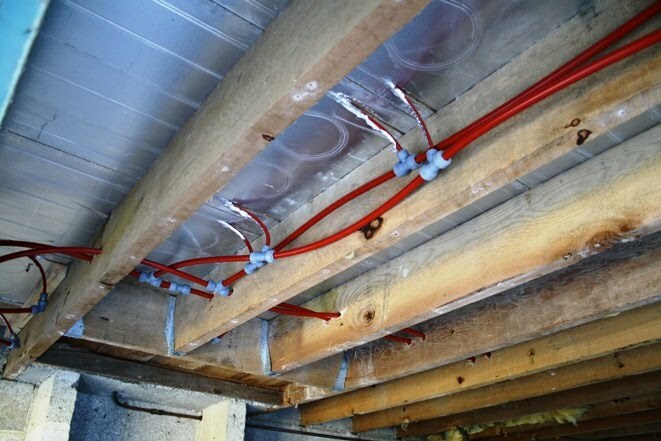 The pipes carrying hot water to heat our house run through the underside of the flooring panels and, where they need connecting together, are completely exposed below the floor. They needed to be accessible for installation so, once complete, our underfloor heating was heating the space under the floor. In this case this was the garage, workshop and store room, or a space equal to the house above. When I was at school, we learnt about three ways that heat can get from one place to another; convection (heat rises), conduction (heat travels along some materials, such as metals), and radiation (heat will just float off into empty space if there's a hot thing surrounded by coldness). More recently, I've learnt that in the context of heating a house, convection is the one that does most of the work and radiation is pretty much irrelevant. Hmm, judging by how warm our unheated downstairs rooms are, I'd say that radiation can be quite important in a house. So... insulation is required. In fact, insulation is part of the specification for the underfloor heating. If I'd noticed that earlier, I wouldn't have spent so much time trying to find out how much insulation I needed, as the answer was there in the spec. It's all very confusing, as sometimes it's expressed in terms of how much heat is let through, and sometimes in terms of resistance to heat (U values and R values respectively. At least, I think it's that way round. They're reciprocal, anyway.) If you're looking at layers of insulation, one kind - I think it's R values - can be added up but the other kind can't. Once I'd found out how much I needed, I still had the problem of choosing what kind. This was difficult because rockwool is the work of the devil, but lovely fluffy eco-friendly stuff tends to be very expensive. I also wanted advice on what works well, so perused the Green Building Forum, where someone mentioned leaving an air gap between two layers of foil. That seemed like a good idea, especially as I already had one of the foil layers pasted to the underside of the heating panels. There's a modern type of insulation that consists of layers of foil and spacing, which is claimed by manufacturers to be equivalent to much thicker bulk insulation. The difference is that foil works as a reflective barrier, bouncing radiated heat back, whereas traditional insulation just traps as much air as possible without letting it circulate. If I could get the thinnest (cheapest) type of this fancy new foil stuff, that would make a good start to my insulation. I wasn't particularly short of space, so no need to go for all super-thin fancy stuff. I'd fill out the rest with traditional bulky insulation. I'd much rather have nice eco stuff but, as noted above, it does tend to be expensive. I needed to know just how much more expensive, so set about doing a bit of research. I took the first price I found for rockwool, which probably wasn't the cheapest, as a baseline. Sure enough, most of the eco products I found were several times the price, until I came across Black Mountain sheep's wool insulation which was only 20% more expensive. I had to double check that, but it was true. It's also Welsh, so a relatively local product. The only drawback of using sheep's wool (or indeed rockwool) to insulate a ceiling is that it's floppy, which makes it a bit of a challenge to put up. The third component of my insulation would have to be boards to hold the wool up. At this point I ran out of green-ness. I did check eco alternatives to plasterboard, but they were so expensive that I gave up and ordered standard, cheap plasterboard. At least it's not as nasty as rockwool to work with. I also bought sticky tape to hold the foil up and screws to hold the plasterboard up. As for holding the wool up, I'll come to that later. Insulation in the garage, just waiting to be put up. As you can see, the sheep's wool is indeed bulky, whereas the foil - just one roll, over there on the right of the photo - takes up far less space. I'm not sure if the plasterboard had been delivered by this time, but if it had, it's on that heap of boards in the middle. I started in the garage because most of what was in there was the insulation itself, and that heap of boards in the middle of the room made quite a handy platform to stand on when working on the ceiling. Also, the joists were parallel and evenly spaced in there, which made the job somewhat easier. Foil insulation taped to the ceiling - not the garage ceiling, but they all looked much the same. The foil looks wonky in that photo because it had to go over (that is, under) some pipes. Once the foil was up, the floppy sheep's wool layer was next. My cunning plan for holding this up for long enough to get the plasterboard fixed underneath it involved wedging struts between the joists under the insulation. The struts in the photo above include foil tape (not ideal, relying on stickiness), buddleia sticks (from hacking back overgrown plants), and strips of Range Rover headlining (don't ask). We also used plastic conduit that once covered electric wires, polystyrene packaging, offcuts of pipes, and various other things that normal people would have long since thrown away. Once the wool was up, we then moved on to the really difficult part (and sheep's wool, by the way, whilst much nicer than rockwool, still drops bits into your eyes when you're holding it over your head, and I'm still picking strands of it out of one wooly jumper I foolishly wore to work on this back in February). We bought plasterboard in 8' x 4' sheets. This is quite big. Certainly too big for one person to hold up while screwing it to the joists, and a bit much for two people, at least if those two people are me and Ian. Taking advice from several people, including my dad, if I remember rightly, we tried assembling a jig consisting of one floorboard placed across the middle of the plasterboard to spread the weight and another jammed between floor and ceiling to hold it up. This was moderately successful, but did have a bad habit of collapsing dramatically as the board was screwed up, taking its weight off the support. Halfway through plasterboarding the garage, our very kind neighbours offered to help us, and the next bit was much easier, with four of us working together. Leaving the garage behind, much moving of things was required to gain access to the workshop ceiling. This ceiling is conveniently divided into three sections by hefty beams running across the room, so I cleared just one section at a time, putting up all three layers in that section before moving things again to get to the next section. Again with help from our neighbours, and from another friend (who may have been bribed with cake), we managed to get the workshop finished. I then moved everything from the store room into the workshop (making the workshop almost inaccessible in the process) and started work on the store room ceiling. I'd got the foil layer done and some of the sheep's wool at the point Dad needed my help with his house in Cornwall, so I left in the middle of the job, intending to finish it when I got back. On my return, utterly exhausted, I found that the wool had fallen down. That was the final straw. I simply couldn't face it any more. And so the job was left, insulation variously hanging from the ceiling or sitting on the ground**, for several months. It didn't improve my motivation when I discovered that the wool on the ground had got damp and mouldy. Back in March I assumed that I would recover from the Cornwall trip and get back to this job fairly quickly, but as I've discussed before, it didn't happen like that. Summer, such as it was, came and went, and the insulation still wasn't finished (and the stuff was going mouldy). My sister, kindly but firmly, told me to get a grip. Well, she didn't quite put it like that. She saw that this particular unfinished project was really getting to me, and something had to be done to get it moving again. "Just pay someone to do it," she said. She had a point (she usually does). It had got to the stage where I couldn't bear to even think about it, never mind face up to actually doing the work. I asked Ian to take over responsibility for making something happen and agreed that it would be worth spending some money. He went round to see someone who does odd jobs for the hotel and had said to us at some point that if we needed stuff doing we should ask him. Within a few hours, he'd come round and the three of us were putting up insulation and plasterboard. Just like that. There was a break for a couple of weeks as either he or Ian were busy doing other things, but then we saw him at the village lighting of the Christmas tree event last Sunday and arranged for him to come over again today, and now the job is finished. I won't say it was easy, but with someone else taking the attitude, "This is just a job to be done - let's get on and do it," the whole thing was a lot less daunting and, well, we did it. I am exhausted now, and my arms ache almost too much to type, but I am so pleased this is finished. I feel released from something that was dragging me back. As a final bonus, when I asked, "How much do we owe you for all this work?" he said, "Nothing. I'll take payment in kind sometime when I need help with something." Isn't that lovely? * That's what this fancy new insulation looks like - a layer of bubblewrap sandwiched between two layers of foil, then coated with another thin layer of plastic to protect the foil. Makes sense to me. ** I use that word deliberately. There's no floor, as such, in the store room. In fact, parts of it are quite muddy. There's a damp patch on the dining room ceiling that I've been ignoring for months. Damp patch on the ceiling. Not pretty, but surely not urgent? Wallpaper trying to fall off the wall and being saved by a picture of a 2CV. You can't see the 2CV, it's busy saving the wallpaper. Ah, maybe this is a problem that I need to deal with. Since this is around the chimney, we assumed that the problem would be with the lead flashing around the chimney stack, but the only way to find out was to go up there and have a look. If the chimney had been on the conservatory side of the house, that would be relatively easy, but it's not, it's on the driveway side. Luckily, our friend Jasper was happy to lend us his scaffolding tower and roof ladder. I went up there, several times. Our neighbour suggested going into the loft to see whether there was moisture on the surface of the chimney breast up there, but after a bit of thought I decided that I'd rather go up on the roof. I hate rockwool insulation (loathe and detest) a lot more than I hate heights (not at all). I would like to be able to show you a photo of what I found up there but my phone battery chose this time to give up the ghost, Ian refused to lend me his Blackberry, and I didn't want to carry a camera that I couldn't fit in my pocket, so you'll have to make do with a description. I found plenty of evidence for what the neighbours had told me, namely that this has been a problem for a long time - ever since the extension was built in fact. There was plasticky sealant slathered over every conceivable gap in the brickwork, including the joins between the flashing and the chimney. It had been applied so liberally that it stood proud of the brickwork. This meant that one small fault in its adherence to the wall would allow water to flow down between the sealant and the brick, and be channeled into the gap between the bricks. I pulled a small piece out and confirmed that this was exactly what had happened - it was soaking wet and covered in moss. Problem identified (well, a problem identified), I needed guidance on how to fix it. I consulted my trusty Readers Digest DIY manual, which had helpful instructions on how to fix various faults with flashing, including repairing the mortar where the flashing joins the brickwork, and where it's appropriate to use sealant (not in place of mortar). We set off to buy some mortar which, since it was Sunday morning by this time, meant B&Q. By far the cheapest option per quantity of mortar would be to buy the ingredients and mix it up ourselves, but since we only needed a little and cement has a very short shelf life we went for the 'just add water' kind, though I very nearly walked out of the shop in disgust at the cutesy instructions - Reach your right hand over your left shoulder and give yourself a hearty pat on the back. Ugh! Having survived B&Q (which wasn't nearly as bad as it can be. The staff at the Aberystwyth branch were very friendly and helpful), I didn't manage to steel myself to get up on the roof again on Sunday (though there was some faffing about with phones and old cameras). Yesterday the weather was clear and dry so I really had no excuse. I went up in the morning to pick off all the old sealant, then again in the afternoon to insert mortar into places where there should be mortar. The second time I took a bottle brush to clear out all the moss. I've never done pointing before - where better to learn than on a chimney? I might add that I only did one side of the chimney and the 'uphill' face as the downhill face didn't need work and I didn't think it was worth moving the ladder to get at the other side when any water that gets in there will end up a long way from the surface of the wall as it's between the old building and the extension. OK, that's not a very good argument, but it would be as much work again to do the other side and I'm not convinced it's necessary. Even after applying the mortar, the job wasn't quite finished. I'd bent some of the lead away from the bricks so I could get at the mortar gaps behind it, then wasn't sure what to do with them afterwards. It seemed wrong to fill a gap with wet stuff then immediately cover it up with a waterproof sheet, but on the other hand, how long does mortar take to dry? I couldn't leave them sticking out for weeks, so I compromised and left it overnight, in which time it hailed three times. This morning, I went up again to put the lead flashing back in place, and to clear up the mess. I had dropped rather a lot of mortar all over the roof. Ian was out so I let the neighbours know what I was doing. They promised to listen out for a scream. In spite of the wooden boards now being wet and slippery, that task passed uneventfully and I was able to assure the neighbours that they wouldn't need to call an ambulance after all. All that remained was to take down the ladder and scaffolding, which was a two person job, so I had to wait for Ian to get home. I just broke off from blogging to catch a break between hail showers and go and do that. We were just manhandling the ladder down to the ground when it hailed again. Meanwhile, with all that climbing up and down a wobbly scaffolding tower (never mind the roof ladder - that tower is the scary bit), the muscles in my legs were aching and getting pretty wobbly too. At one point I was standing on a slippery board with wobbly legs, high enough to look into our upstairs window, and realised I'd have to sit down on that freezing, wet board for safety's sake. This part of the job was not fun. Still, the job is now done and we can return Jasper's ladder and scaffolding. I feel quite pleased with myself, but it would be nice to know whether I've actually solved the damp problem. I guess I'll just have to wait and see. Food, Politics, & Society: Social Theory and the Modern Food System – out now! ERROR: Tried to load source page, but remote server reported "500 Internal Server Error". Holy Crapoly! "A Field Guide to Happiness" at a Steal!